In Barbelo I argue that Christ had promised to return before his generation had passed away (Matthew 24:30-34) and that he attempted to fulfil that promise when he rose against the Romans a couple of decades later, as Josephus’ Egyptian. The Second Coming of Christ was, however, thwarted by Felix, from whom Christ managed to escape. When Paul (an alias of Christ, see related article) was later captured, he was accused of being that very Egyptian who had led the uprising and was subsequently taken to Rome for execution. So, if there never was a ‘Christ’, there most certainly cannot ever be an Antichrist, and assuming furthermore that there is no such thing as prophecy, the origin of this number must be sought elsewhere. There indeed happens to be a ‘666’ that was well known during the first century – it was no more than the name of a simple game of dice. This Roman game was played with three dice and was known in ancient times as ‘Six thrice or three dice,’ where the winning total would be three sixes, but three dice (ones) would count as zero. 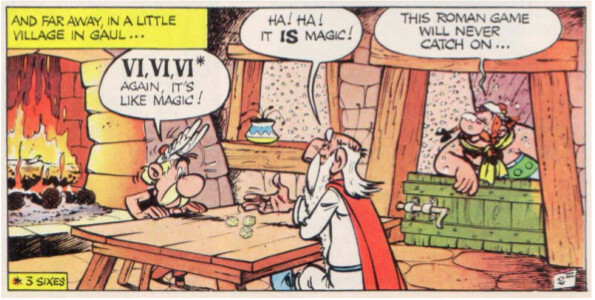 In essence ‘666’ means ‘the winner takes all,’ and it must have been a game regularly played by people in ancient times (see depiction from Asterix and Cleopatra below), due to the simplicity of constructing dice. Based on the style and grammar of the two texts, scholars have long recognised that authors of the Gospel of Saint John and the Book of Revelation, also called the Revelation of Saint John, were two different people. The Revelation of Saint John appears to contain a garbled version of Daniel’s visions, as several ‘visions’ are common to both books, including ‘the Son of man coming on the clouds’, as well as the four beasts of Daniel, which most likely became the four horsemen of the apocalypse in Revelation. Only God will know (pardon the paradox) what had inspired Daniel’s visions. It would therefore seem that the Revelation of Saint John was written by someone who had contact with John, most likely during John’s imprisonment, and who had taken it upon himself to record John’s visions about the returning Christ. He must have remembered something about the game of dice which he and John, or perhaps John and a fellow inmate, used to play and worked it into the document as it stands today. There is simply no other possible origin of this number. PS: When I presented the above interpretation at an appropriate forum, it was argued that the Greeks did not have a decimal system similar to ours at that time, and that three sixes next to each other could not possibly have been interpreted as the decimal number 666 as recorded in the Book of Revelation. This, however, is not true at all. The Greeks did possess a decimal numbering system several centuries before Christ, but it was different from ours in that it did not possess a zero as a placeholder. Instead, they used different letters of the Greek alphabet to present ones (α…θ for 1...9, ι to ϙ for 10 ... 90, ρ to ϡ for 100 ... 900, and so forth), as shown in the Ancient Greek table below. A modern three-digit number would have been expressed as the sum of the hundreds, the tens and the ones. For example, 241 would have been expressed as ΣΜΑ (200+40+1), 601 as ΧΑ (600+1), 610 as ΧΙ (600+10) and 666 as χξϛ (600+60+6), as recorded in the Book of Revelation. Is it possible that the ancient Greek players of this game of dice could have interpreted three dice with sixes next to each other or in sequence as the number presented in Revelation? Why not simply add up the numbers of the three dice, which would yield a sum between 3 and 18? If significantly more than two players were involved, it could very well be that the dice were tossed sequentially, the first throw representing the ‘ones’, the second the ‘tens’ and the third the ‘hundreds’. That would give a total of 6x6x6 = 216 possible values, instead of the 16 values if the individual values were simply added together (minimum 3, maximum 18). Among 5 or 10 or 20 players the sequentially-numbered totals would have reduced the chances of individuals ending up with the same totals, for instance making elimination easier. It would seem, then, that the Greeks who played this game could indeed have recorded the decimal number ‘666’ in this manner.